opensim-users - New Arrival! JVWR new issue "Edge" is published! New Arrival! JVWR new issue "Edge" is published! 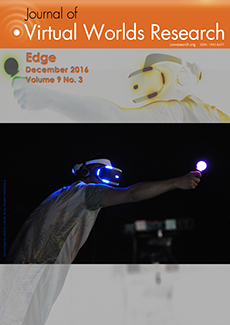 A collection of 5 papers which suggest new angles and unique points of view, is presented in this Edge issue. Each of these five papers pushes the boundaries of the disciplines in a different way. Together, they demonstrate the dual value of the JVWR, first as a stage to explore the future of virtual worlds (defined broadly,) and then help to shape the future of real worlds. The issue is also an invitation for you readers to first explore JVWR’s past issues at our website, and then contribute as authors and as editors of future special issues. We are looking for issue editors to manage the next Assembled 2017 issue. Issue editors take full charge of one issue. The Assembled issue is a place for various papers, on the topic of the journal - that are being collected during the year and published usually once a year. At least 10 papers are already in the system, awaiting your editorial skills. Each issue is managed by one managing Issue Editor with 2-3 co-editors. The managing Issue Editor is the prime contact person and the leader behind the issue. If you are interested, we'd love hear from you. Please visit For Issue Editors page to learn more about becoming a JVWR editor. You are invited to browse JVWR's previous issues. Looking forward to hearing from you on twitter @TheJVWR and on our Facebook page (TheJVWR).